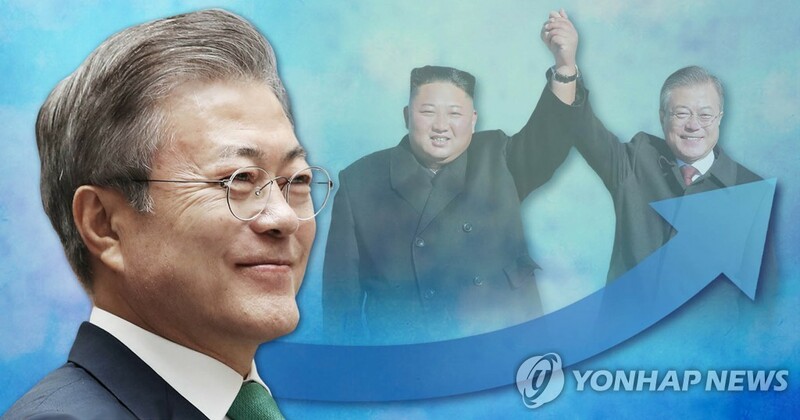 SEOUL, Oct. 1 (Yonhap) -- President Moon Jae-in's approval rating continued to rise last week, a poll showed Monday, following his historic summit with North Korean leader Kim Jong-un, which has apparently helped restart the North's denuclearization process. The president's approval rating came to 65.3 percent last week in a weekly poll conducted by Realmeter. The reading is a 3.4 percentage point increase from the week before, when Moon's approval rating jumped 8.8 percent on-week. The improvement follows Moon's Sept. 18-20 trip to Pyongyang for the third Moon-Kim summit in less than five months. The leaders of the divided Koreas first met in the border village of Panmunjom on April 27 and again on May 26. The latest summit was aimed at breaking a deadlock in denuclearization talks between the United States and North Korea, which had stalled after U.S. President Donald Trump called off a scheduled North Korea trip by his top diplomat, Mike Pompeo. Shortly after Moon's Pyongyang trip, the U.S. said it will soon resume the denuclearization talks with the North. The latest survey was conducted Thursday and Friday, involving 1,502 adults throughout the nation. With the president's approval rating going up for a second consecutive week, the ruling Democratic Party too saw its own rating go up over the same period. The ruling party's approval rating came to 45.9 percent, up 1.1 percentage points from a week earlier. The approval rating of the main opposition Liberty Korea Party dropped 1.6 percentage points to 17.0 percent, while that of the splinter Bareunmirae Party remained unchanged at 5.7 percent. The minor opposition Party for Peace and Democracy saw its rating go up 0.2 percentage point to 3.3 percent, while the progressive Justice Party's approval rating gained 1.9 percentage points to 10.2 percent.